Who doesn’t love following the Olympics?! We love the success stories that are played out in the pool and field and mat. But we also love the stories of the incredible journey most of these athletes take to get to the Olympics. Personally I think the story of Yusra Mardini and her heroic swim that saved the lives of her fellow refugees takes the cake – or the gold. But heroics aside, imagining the day-to-day grueling practices necessary to build skills and muscles of Olympic caliber is . . . inspirational. It’s inspirational because it’s a path few can take. And the few who take follow this uphill path must do everything differently. Eat differently, train differently, and for the younger athletes – go to school differently. Think about it – if you’re 15 years old and training hours a day and perhaps traveling to training sites and competitions, how do you “do school”? Answer: Differently. Picabo Street, Olympic gold medal downhill skier, faced this same problem in her youth. When she was in a position to give back to the sporting community, she knew helping to provide quality, flexible education for young athletes would be her passion. Thus, Picabo Street Academy (PSA) was born. PSA works to provide the individualized education for elite student athletes. 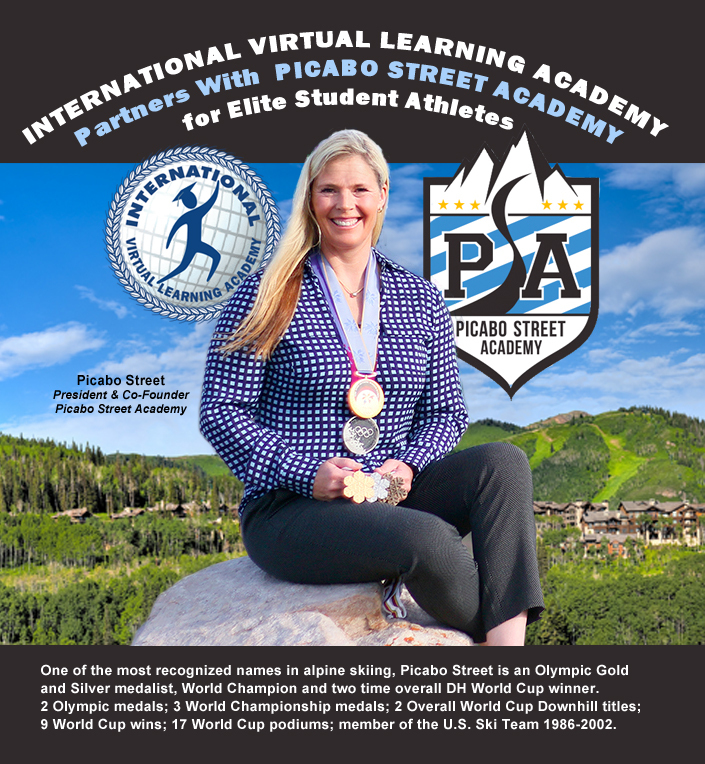 Picabo Street Academy has recently partnered with International Virtual Learning Academy (IVLA), a fully accredited online private school. Having educated many student athletes and having earned approval by the National Collegiate Athletics Association (NCAA), IVLA is experienced and qualified to bring excellence in education to those striving for excellence in their sport. IVLA is an ideal choice for young elite athletes because of its year-round, open enrollment. This gives student athletes the flexibility to choose when to begin their school year. Because classes are delivered in an online format, students can set their own schedule, working whenever and wherever they choose. This feature allows school to dovetail with their training and tournament schedules. Also, at IVLA each course is supported by a certified teacher and each student is supported by a mentor who tracks student progress and works closely with the student’s family.